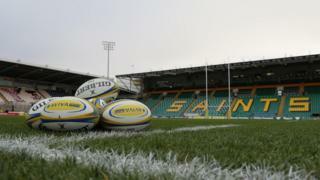 Councillors spent public money on a hospitality box and hiring a plane as the authority headed towards financial crisis, an investigation has found.Payments were made by a company owned by Northamptonshire County Council whose directors were councillors.NEA Properties, which bought the box at Premiership rugby side Northampton Saints, was dissolved a month before the council banned spending.The BBC has contacted the councillors concerned for a response.An independent audit report found that NEA Properties' "expenditure incurred was consistent with the authority and purpose of the company and its directors". The company was incorporated in 1983 under the name Northamptonshire Enterprise Agency to promote the county and managed a number of units at the University of Northampton campus.Conservative councillors Bill Parker and Andre Gonzales De Savage had served as directors in the company since 2010 and 2007 respectively. It sold its properties in September 2014 and Concerns about finances at the council - which has been issued with two Section 114 notices, banning new spending - were made as early as 2013, according to former leader Heather Smith. Worries over NEA Properties were first raised by a whistleblower, former UKIP councillor Michael Brown, in January 2017.An audit was then commissioned and found the payments were made with "minimal" governance and documentation.It found no evidence of improper spending or management by the company "but in the absence of various records only limited assurance can be provided".The audit was also told ?80,000 spent on Northampton Saints went on the redevelopment of a new stand at the Franklin's Gardens ground, but the club denied this was what was purchased.A club spokesman said it could "confirm the county council had a box as part of a marketing package which they purchased". Financial adviser Mr Brown said the lack of a detailed audit trail was a "unbelievable in this day and age".He added: "As a public organisation they were keeping secret the accounts of a limited company it owns under the small companies exception. "This should not happen as it leaves itself open to abuse of public funds. "A spokesman for the council said the report found that although limited assurances were provided about the company, "the organisational impact was minor".He added: "The report also found that expenditure and financial transactions were transparent. "However, the committee did draw up a number of recommendations and work on addressing these will be done as soon as possible."